United States World Cup winner Carli Lloyd played in the Women's Super League with Manchester City in 2017Manchester United's women's team can sign the "Carli Lloyds of this world" within five years, says a former player of their disbanded women's side.United's new team has been handed a licence to join England's second tier, the Women's Championship, next season.Lauren Aldred, 32, played for United's women's side before it was scrapped by the club in February 2005. "I hope they have success but, to me, I just love to see the commitment to it," Aldred told BBC Sport. "I don't think they will go above and beyond in the first year. Like anything that's new, it takes time." "Do I think that will be in the next year? No, I don't. Could it happen in four or five years? 100%. "United officially affiliated themselves with a local women's side of the same name in 2001, but the team failed to reach the top tier of English women's football.The outfit was disbanded four years later, with the club saying their resources were better aimed at school-level girls football rather than a senior women's side. "I'd love to see United up there on the women's side of the game, competing against clubs such as Arsenal, Chelsea and Manchester City," added Aldred. "For me, it's like 'let's get going United'. You invested once, let's do it again, and they already have a centre of excellence and under-16 team in place." Baroness Campbell has been the FA's head of women's football since January 2016The FA's head of women's football, Baroness Sue Campbell, told BBC Radio 5 live: "Manchester United have had a very good community programme and regional talent club for a long time, so this was a natural next step and we're delighted they've chosen to step in at this point. "We're growing the women's game now in a completely different way, trying to create a real step-change. I think Manchester United felt this was a good time to step forward and get involved." Until the end of the 2017-18 season, United only coached until under-18 level with some players, such as Katie Zelem, having to move to rival clubs in order to play senior women's football. "United's youth system and centre of excellence was amazing but to not have what's next for these kids - I didn't understand that," said Aldred. Manchester United have come under criticism for not having a women's team despite their status in the men's game"For the kids to have the opportunity provided there is absolutely amazing. It pains me that Manchester City are so well developed on the girl's side. 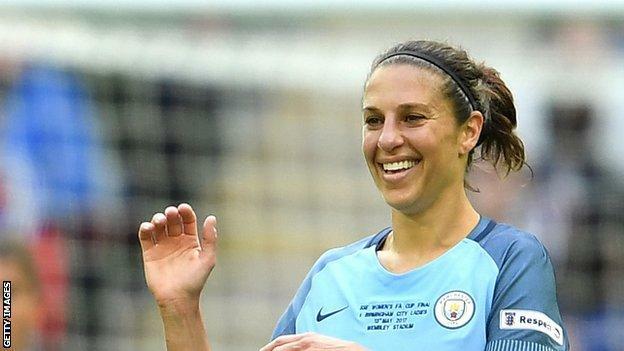 "The newly-formed team will be based at the Cliff training ground in Salford and it is anticipated that they will play as a full-time team in the second tier next season.She added: "If you look at City, the women are training at the same complex as the men. They've got full-time professional players there. "When we trained, we were never at that level so our interaction with the men's team [at the Cliff] was very minimal, if any. You might find a first-team player or two come over and show their face to the boys' youth team, which meant they might show their face to us too. "But there was never a moment where Sir Alex Ferguson came and greeted us or anything like that."